Are you having trouble writing a thank you page? When set up correctly, a good thank you page will help you to track the conversion rate of your form and boost customer loyalty. In this article, we’ll show you 5 thank you page examples for boosting customer loyalty. With WPForms, you can either show a confirmation message to your visitor or direct them to a thank you page after submitting a form. Showing a confirmation message beneath your form is the easiest way to confirm your visitors that the form is being submitted successfully. Better tracking: You can track the conversion rate of your form by creating a Google Analytics goal. By tracking the conversion rate, you can see whether changes to your form are boosting your form conversions. Increase engagement: You can customize your thank you page by integrating useful links to various resources on your site. This way, you can increase your visitor engagement. Boost customer loyalty: Creating a customized thank you page gives you opportunities to boost customer loyalty by creating a deeper connection with visitors who reach out to you. With WPForms, you can easily direct your visitors to a thank you page after filling out your form. To direct your visitors to the thank you page, you can go to your form builder. Then navigate to Settings » Confirmation and then, choose Show Page as your Confirmation Type. In the Confirmation Page dropdown menu, you can choose the right thank you page you’ve just created. To track your conversion rates, you can refer to our guide on how to track form submissions in Google Analytics. Now that we’ve discussed how to create a simple thank you page, let’s take a look at a few thank you page examples for boosting customer loyalty. In many cases, creating a simple thank you page is NOT an ideal solution. This is especially true when you’re building an email list. In that case, you’ll have to create two thank you pages to entice your visitors to take an action. To confirm email upon form submission: After submitting your form, you can direct your visitors to a thank you page where you can ask them to check their email right away to confirm their email address. To confirm subscription: After they confirm their email address, you can direct your visitors to a thank you page that confirms that they’ve successfully added to the list. 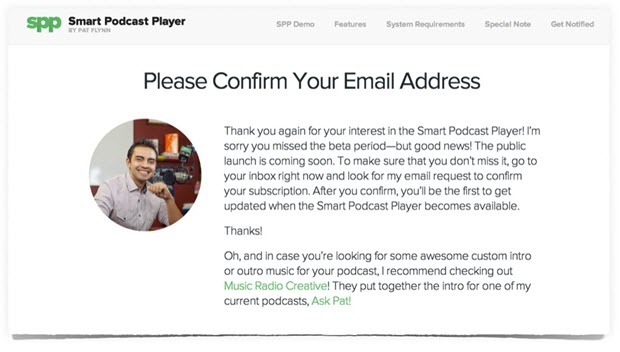 Take a look at an excellent example of a thank you page by Smart Podcast Player that encourages visitors to take the desired action. Below are a few actionable tips you can learn from the above example. Create a customized title: Rather than using a generic “Thank You,” ask them to take the desired action right away in your title. 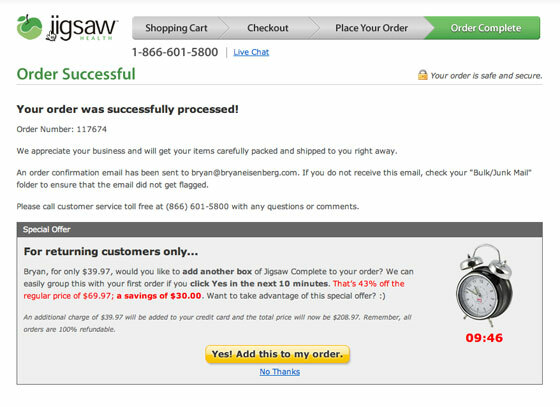 This way, you can persuade more visitors to confirm their email address. Write detailed, compelling copy: In the body of your page, you can thank your visitors and explain in detail how to confirm their email address. In your thank you page, adding relevant links to useful resources is a great strategy to increase visitor engagement. If you’re looking for inspiration, you can check out the below thank you page example. 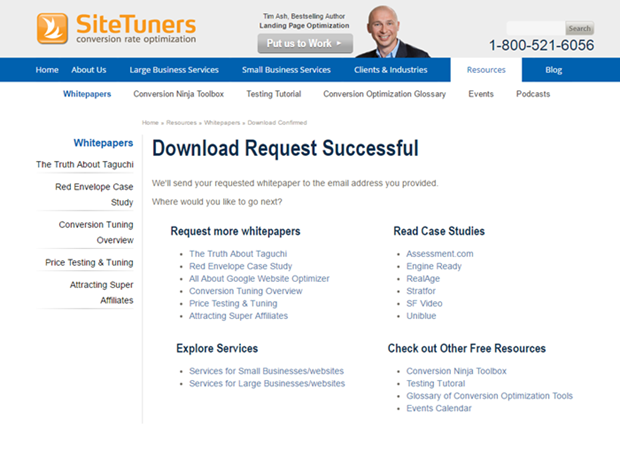 You can see that SiteTuners included relevant links to white papers and case studies in their thank you page. By submitting any form on your site, your visitor is taking a step towards becoming a loyal customer. With a customized thank you page, aside from showing gratitude to your visitors, you can help them to take the next step to becoming more loyal to your brand. Take a look at a thank you page example below. In addition to showing gratitude for the purchase, the page features a special offer to make an additional purchase, and become more loyal to the brand. It is disappointing when your subscribers take a negative action like unsubscribing from your email list or requesting a refund for their recent order. While you can’t always convince your customers to reverse their negative action, it is possible to turn their negative experience into a positive brand perception. Take a look at an example of HubSpot. 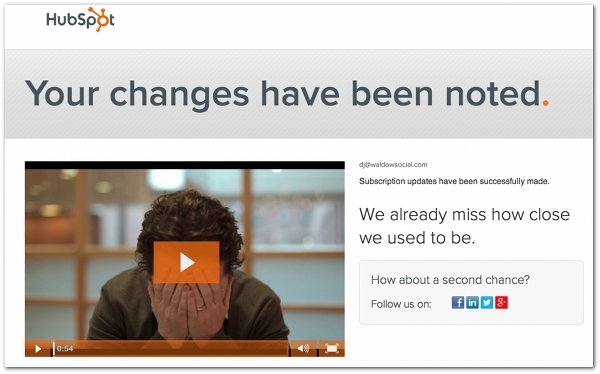 HubSpot has a cute email unsubscribe page that can bring a smile on your face. It features a video by Dan Sally who seems disappointed in the video because you’re unsubscribing. Additionally, in the thank you page, subscribers are encouraged to follow HubSpot on social media. We hope this article introduced you some excellent thank you page examples to get inspired. When creating a thank you page, always remember a few things. Track the performance of your form: You can compare visitors to a page on your website against those that have submitted the form on that page in Google Analytics. Refer to this guide to learn more. Hide your thank you page from Google: You can instruct search engines not to index your thank you page using the robots.txt file of your site. For detailed instructions, you can refer to this guide on How to Hide a WordPress Page from Google. You might also want to check out our article on 3 Form Success Message Ideas to Boost Customer Happiness. i need your help. I am looking all over this webpage to get help with a confirmation page that shows my blog. I am using WP forms and I set up the contact form and it sends a reply to the business address (admin) but under confirmation, I selected show page and selected BLOG. I tested it out and it doesn’t show me anything. Could you help me?